"The greatest need of our time is to clean out the enormous mass of mental and emotional rubbish that clutters our minds." Between the upcoming U.S. presidential election, and the social-psychological make-up of 83 million Millennials, representing more than one-quarter of the nation's population, are we witnessing an increased level of self-centered behavior? Does this mean "narcissism" is on the rise among the general population? According to an article in the October 2016 issue of "Psychology Today," the growing consensus among psychologists is--no. 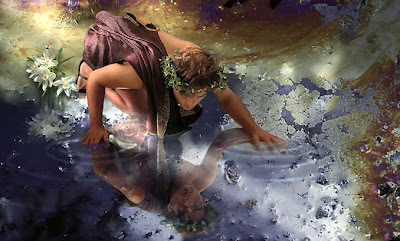 It's estimated that narcissistic behavior, a term originating in Greek mythology when Narcissus fell in love with his image in a pool of water (see below), is found among only 1% of the population with the percentage remaining about the same since tracking studies began. Narcissus viewing his own image. So what exactly is narcissism? Craig Malkin, a lecturer at Harvard Medical School and author of "Rethinking Narcissism," says, "it's the capacity to see ourselves through rose-colored glasses." And Dr. Malkin makes clear that it's a trait each of us exhibits to a greater or lesser degree. That narcissism can be helpful is proven in studies. For example, a healthy dose can fuel confidence which allows us to take risks, like seeking a promotion. It's feeling too special that causes problems. Writing in "The New York Times," Daniel Goleman, describes good managers as easy to spot. He quotes Robert Hogan from the Tulsa Institute of Behavioral Sciences, who says, "Besides intelligence and a knack for strategic planning, they have enormous charm and energy." That is, "they have charisma." Dr. Hogan goes on to say that charisma has its dark side. "Some top executives who look good to their peers and their bosses and who do well on most assessments, turn out to be terrible for their companies," he said. "These are flawed managers, whose glittering image masks a dark destructive side, Dr. Hogan added. "They end up being costly by creating poor morale, excessive turnover, and reducing productivity. Sometimes they can ruin a company altogether." As author, Ira Chelaff, once observed: "Arrogant leadership is toxic to an organization. It looks like strength but is a debilitating weakness." Groupthink. Workers feel they must censor what they say in meetings. Distortions of the truth. Twisting facts to please the boss. Tension. Employees don't feel like themselves in the boss's company. Humorlessness. The tone is grim, there's no joking around with the boss. Blind loyalty. Excessive demands made to show loyalty. Rebecca Webber, the author of the PT article, says, yes. "If a fragile self is the true underpinning of narcissism," Webber writes, "one way to strengthen it is with self-compassion which leads to more stable feelings of self-worth, as opposed to self-esteem." Webber is coming close to the idea of "grace"--from ourselves, and others. Giving and receiving when needed. Dr. Malkin, the specialist from Harvard, offers this insight, "By increasing security, narcissism drops." "Perhaps the difference between good and bad leaders comes down to a distinction between healthy and unhealthy narcissism," Daniel Goleman concludes. To achieve healthy leadership, should we add "humility" to strength of character? Then maybe our reflection in the pool of water might begin dissolving, over time, into something less arrogant, more sincere and self-aware. That kind of arduous change, in behavior and spirit, would go a long way in clearing out "the rubbish of our minds."